Greenlee Textron Inc. is known as a global leader in the professional tool category developing high quality, innovative products for the skilled trades. Greenlee tools have helped professionals worldwide across electrical, utility, communications, plumbing, HVAC and pipefitting to get the job done faster, safer and easier. The company's family business culture and commitment to employees and local communities have guided its success for more than 150 years. Greenlee began with Ralph and Robert Greenlee, Pennsylvania twins who developed a dream and pursued it relentlessly from the growing Midwestern metropolis of Chicago and then expanded to Rockford. 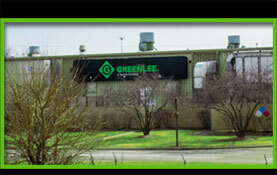 Built on hard work guided by vision, the Greenlee history is a small slice of the American Dream.Greenlee continues to invest in high technology to meet the changing needs of its customers with certified modern facilities, sophisticated production equipment, and enhanced quality assurance programs. Safety is a cornerstone of the company's core values, which drives unique tool designs proven to reduce injuries on the job and new manufacturing processes that protect employees.Greenlee Textron, Inc. continues to be an integral part of the Rockford community, regularly supporting local charities, schools and small businesses.